It is impossible to speak about our situation in America unless we refer it to our normal and essential term of reference, the Orthodox Church. The Ortho­dox Church–whether Greek, Syrian, Serbian, Romanian, or Bulgarian–has always been both the heart and the form of an Orthodox world. Only here in the West, and for the first time in the history of Ortho­doxy, do we think of the Church in terms only of a religious institution such as diocese, parish, and so on. No one in organically Orthodox countries has ever thought of the Church as being distinct from the total­ity of life. Since the conversion of Constantine, the Church was organically related to society, culture, education, family, etc. There was no separation, no dichotomy. The Russian word for peasant is simply christianin, which at the beginning obviously meant Christian. The first Orthodox immigrants in America never thought about all this, for in many ways they continued to live within an organic Orthodox “culture.” They were still living within that type of unity be­cause they belonged to what in American sociology is known as a “sub-culture.” After the liturgy, Russians or Greeks would meet in the church hall, and they would meet not only as Orthodox but as Russians or Greeks or Bukovenians or Carpatho-Russians-and they would meet precisely in order to breathe their native culture. Our faith cannot be reduced to religious practices and customs alone. It claims the entire life of man. But the culture in which we live, the “American way of life,” is something which already existed when we came here. Thus we find ourselves an Eastern Church with a total claim on our life, yet living within a Western society and a Western way of life. This is the antinomy of our situation; this is where all our difficulties are rooted. Yet unless we understand it, we will always have wrong solutions. These wrong solutions–quite popular today–follow two basic patterns. I will call one pattern a “neurotic” Orthodoxy. It is the attitude of those who, whether they are native Orthodox or converts, decide they cannot be Ortho­dox unless they simply reject American culture, who build their spiritual home in some romantic and ideal­ized Byzantium or Russia, and who constantly curse America and decadent Western society. To them, “Western” and “American” are synonymous with “evil” and “demonic.” This extreme position gives a semblance of security. Ultimately, however, it is self-destructive. It is certainly not the attitude of Saint John, who, in the midst of a violent persecution, said so simply, “And this is the victory that has overcome the world-s-our faith” (1 John 5:4). And further, he said, “There is no fear in love, but perfect love casts out fear, because fear involves torment” (1 John 4:18). In the attitude of some, however, Orthodoxy is transformed into an apocalyptic fear which has always led to sectarianism, hatred, and spiritual death. I have already said I have no ready-made an­swers. I do, however, have a few thoughts which I would like to share with you–a few thoughts about the conditions which may set us on the difficult path. One of the great dangers of modern, and especially American, culture is its reduction of man to history and to change. This is the first thing we Orthodox have to denounce and to resist. We must openly con­fess that there are things which do not change, that human nature does not, in fact, change; that such realities as sin, or righteousness, or holiness do not depend on the changing pattern of culture. How many times I have heard, for example, that in “our age” the concept of sin must be changed if it is to be relevant to modern man. How many times we have heard that in “our age” we cannot speak of the Devil. Yet I am absolutely convinced that sin is ex­actly the same for me as it was for Saint Paul, and that if there is no Devil, Christianity is no longer the same religion it was for nearly two thousand years. It is not enough to speak, as some Western theologians do, of the “demonic.” It is not enough to identify sin with alienation. And it is at this point that Orthodoxy has a tremendous responsibility, for it is fundamentally the belief in unchanging realities, it is the denunciation of all “reductions” as not only doctrinally wrong, but existentially destructive. But now let me share with you my second preliminary thought Just as each one of us must discover for himself the “unchanging” and take part in the same, never-ending, spiritual fight, we must dis­cover ourselves as belonging to one particular genera­tion of Orthodox Christians living in the twentieth century in America, in a secular and pluralistic culture and in the midst of a great spiritual crisis. What can we do together? What are the Orthodox imperatives for our common and corporate task? I think that here the priorities are rather clear, espe­cially when one speaks to students and for students, for “student” is today the purest representative of what I call the second Orthodoxy in America. The first one–whether he came from the “old world” or was born here–is still an immigrant in his mentality. He lives within the American culture but is not yet an organic part of it. But, what is a mission? Mission is one of those words much used and much abused today in America. So we must, first of all, clarify its meaning for us. On the one hand it is clear to all, I hope, that in a sense every Christian is called to be a missionary. Every Christian is sent. When we say “One, Holy, Catholic and Apostolic Church,” the term “apostolic” means not only the continuity of ministry, as so many people seem to think, but also the apostolicity, i.e., the mis­sionary nature of the Church and of each of her members. My being a missionary can be understood in a threefold way. In the first place, I am sent to myself. This means that the new Adam in me is always ready to challenge and to fight the old Adam–the “I” who is still very much “of this world” and subdued to it. And finally, I am sent as a missionary to the world. The scope of our vision and faith is always the salvation of all that for which Christ died, and He died “for the life of the world.” Thus, one cannot be saved without giving oneself to this mission. Everyone is a missionary . Yet, on the other hand, as we begin seeking for concrete applications of these general definitions, the idea of mission becomes confused. It is indeed the eternal problem for each Christian individually and for every Christian generation to find their modality of mission–the way God wants them to fulfill their missionary calling. Just as each man is unique, the way of his fulfillment of his vocation is also unique. And just as each historical situation is unique, the Christian mission of each generation is also in a way unique. This is why there are so many disagreements and controversies among Orthodox today. Everyone admits that something needs to be done, but there is no consensus yet on what exactly is to be done and how. 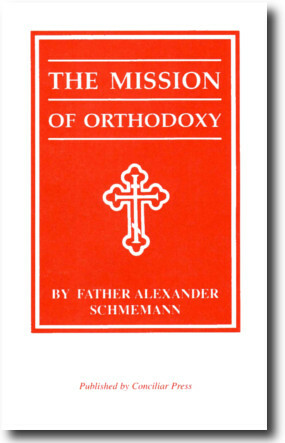 The disagreements concern, indeed, the nature of the Orthodox mission today. In such a situation, we must always begin by looking to the past, by consulting with our tradition–­not “archaeologically,” with an impossible, unrealis­tic, and futile desire simply to “restore” the past, but in an effort to discern the mind of the Church. The entire history of the Church is in a way the history of her mission, that is, of her relation to and action in the world. And as we look into that past, we discover there a rhythm, which I think could be defined as the rhythm of crisis and consolidation. Consider, for example, the Book of Acts, the earliest record of the Church’s life. It begins with an almost idyllic description of the first community in Jerusalem. The Church is growing, she is liked by all people, she is at peace. The difficulties–like the one with the couple who tried to lie and cheat–are quickly solved. Then comes the crisis, which is pri­marily a radical change in the external–cultural and spiritual–context within which she has to live. Suddenly there are new problems facing the Church and disturbing her initial peace. There is the problem of mission to the non-Jews, the problem of circumcision, the concerns about the Jewish way of life–not even questioned before. It is, in other words, a crisis of growth, which is always painful and bitter. The Apostle Paul–the bearer and the symbol of the crisis–knew that without facing it, the Church would have remained a little Jewish sect and would never have been the universal challenge, the universal “question mark,” on everything in this world–all that she actually did become because of that first crisis. But then a period of consolidation begins. 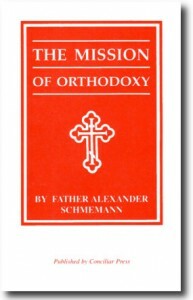 From the midst of the second until the end of the third century, we discern a constant effort to do just that: to consolidate, to organize, to define the life of the Church, to build it on clear and solid principles­–the apostolic succession, the apostolic constitutions, the apostolic traditions, the canon of Scripture. On the eve of Constantine’s conversion the Church exists as a well organized institution, “adjusted” to her universal mission, with a well-oiled mechanism for the solution of her daily problems. There comes, however, a new crisis, provoked this time by the conversion of the Emperor and–in him–of the entire Graeco-Roman society. The Em­pire, which to the Church was the very symbol of the Antichrist, the Harlot, the new Babylon, becomes Christian. And it becomes Christian by a direct intervention of Christ Himself, who elects Constantine to be a “second Paul.” Once more the entire framework of the Church’s life is radically altered. There comes not only security and peace, but also wealth and privi­leges, the splendor of new basilicas, the rain of gold and silver, the political power, the new social status. For what is institution? It is the very fact of the presence and continuity of the Church, always the same, in the world, regardless of all crises, of all changes. It is the guarantee that whether there are prophets or not, whether there are saints and leaders to inspire and lead us, there will be a priest standing at my bed at the hour of my death, pronouncing words of hope, joy, and victory which he did not invent and may even have not felt, but which through him have been preserved by the Church. It is the guarantee that Sunday after Sunday someone–who may be good, bad, or mediocre–will have the right and the duty to offer to God “His own of His own on behalf of all and for all” and thus to make possible all charisms and all inspiration. Finally, the movement is to care about those needs of the Church about which a parish or a diocese does not or cannot care: reaching youth, finding the total place and function of the Church in our world, accepting–creatively–the challenges of modern culture. All this is our task because being not of this world we are in it, left in it to witness and to reveal.